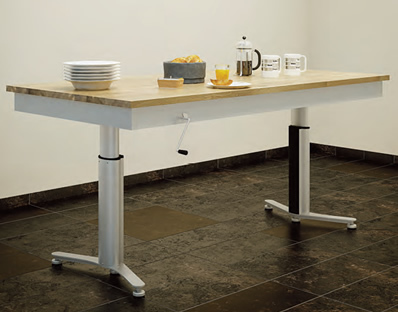 If the wall structure in the kitchen is not sufficient to support a wall-mounted table lift, our Indivo manual & electric frames are ideal for freestanding worktops and tables. These are available in any length up to 3m long and between 700 to 1000mm wide. It is advisable, but not essential, that a 100mm high worktop plinth is fitted to accommodate either the manual crank or electric switch or safety stop. Total loading capacity including worktop is 100kg. Height adjustment ranges from 680mm to 980mm. All electric models come with safety stop as standard.